The TRU women’s soccer team beat the Winnipeg Wesmen 6-1 on Oct. 13 at Hillside stadium. First-year forward Chantal Gammie had her breakout year as she scored her first hat trick for the WolfPack team. Gammie has scored six goals so far. TRU dominated the game from the word go and never allowed Wesmen to get settled. Thompson Rivers outshot Wesmen 15-4 in the first half alone and 25-7 in the game as a whole. In soccer the number of shots a team has means nothing unless those shots are turned into goals; in this game TRU made the most of their opportunities. Gammie scored in the twelfth minute after receiving an assist from Marlie Rittinger. Rittinger, one of the key players and leaders for the ’Pack showed how important she is to the team with another assist for Gammie’s second in the fourteenth minute. 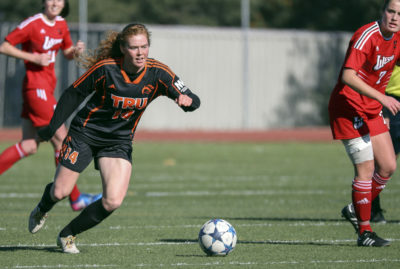 Things got even sweeter for TRU when Katherine Walkley scored off a rebound in the fifteenth minute to put TRU up 3-0. TRU further asserted their dominance as Camryn Curts scored her first goal of the season at 34 minutes and 56 seconds into the game. Gammie then completed her hat trick 36 minutes into the game, marking her sixth goal of the season. Winnipeg managed to get a consolation goal ten minutes after half before Jollee Perrier completed the rout in the eighty-seventh minute. It was her first goal as a member of the ’Pack team. It was a much-needed win for the WolfPack who are still hoping to secure a playoff spot. The ’Pack had a change of fortunes as they lost 1-0 to a well-organized Manitoba Bisons on Oct. 14 at Hillside Stadium. It was the final home game of the season and it was Marlie Rittinger’s final game for TRU. TRU had more shots in the first half, but despite this the Bisons were the ones who were able to find the back of the net as Bruna Mavigner scored in injury time. From that point on the game was very uneventful with the Bisons happy to sit back, get numbers behind the ball and defend. They deserve a lot of credit as they defended well and unfortunately for TRU they couldn’t break them down. “I love the way we responded, I love the hard work we put in today and the chances we created,” Shantz said after the game. Shantz was gracious in defeat giving credit to Manitoba for their good organization and disciplined defence. “We have to accept fate, we didn’t get robbed,” Shantz said. Shantz did confess that he felt his girls did have the ability to find and create the space necessary to find an equalizing opportunity, but unfortunately it wasn’t meant to be for the ’Pack. Shantz, ever the optimist, is focused on helping his team into the playoffs and has already shifted focus to next week which will be a massive weekend for the team, who will need to win both games against UNBC and MacEwan and hope that UBCO loses one of their games. Marlie Rittinger was honored in her last appearance as a TRU player, Shantz had high praise for her and felt that she impacted the program with her example on the field. “She is a kind and quiet person off the field, she leads by example, has calmness on the ball and a skill level and physicality that is rubbing off on the team,” Shantz said. The team will be hoping for the best when they take on UNBC and MacEwan, just as ’Pack supporters will be hoping for a huge performance from their girls.